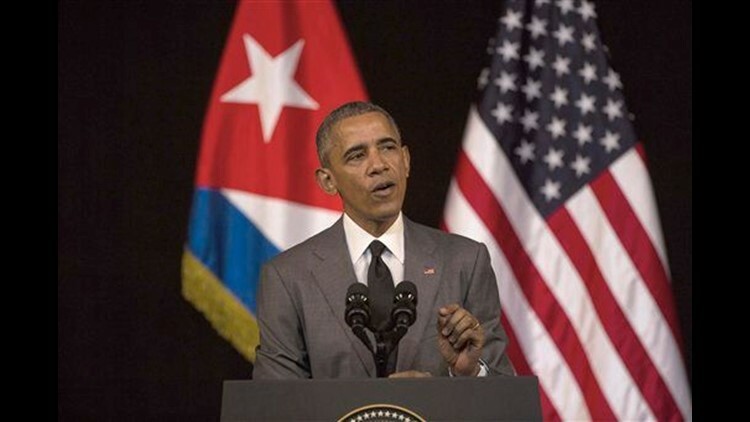 HAVANA (AP) — Capping his remarkable visit to Cuba, President Barack Obama on Tuesday declared an end to the "last remnant of the Cold War in the Americas" and openly urged the Cuban people to pursue a more democratic future for this communist nation 90 miles from Miami. With Cuban President Raul Castro watching from a balcony, Obama said the government should not fear citizens who speak freely and vote for their own leaders. And with Cubans watching on tightly controlled state television, Obama said they would be the ones to determine their country's future, not the United States. "Many suggested that I come here and ask the people of Cuba to tear something down," Obama said. "But I'm appealing to the young people of Cuba who will lift something up, build something new." On the streets of Havana, the president's address sparked extraordinarily rare public discussions about democracy, and some anger with Cuba's leaders. Cubans are used to complaining bitterly about economic matters but rarely speak publicly about any desire for political change, particularly in conversations with foreign journalists. Juan Francisco Ugarte, Oliva, a 71-year-old retired refrigeration technician, said the American president "dared to say in the presence of the leaders, of Raul Castro, that (Cubans) had the right to protest peacefully without being beaten or arrested." Omardy Isaac, a 43-year-old who works in a gift shop, said, "Cubans need all of their rights and I am in favor of democracy." Later, Obama sat beside Castro at a baseball game between Cuba's beloved national team and the Tampa Bay Rays of America's Major League Baseball. Leaving the game early for Jose Marti International Airport, Obama was met there again by Castro who walked him to Air Force One. They chatted in relaxed fashion, any awkwardness or tension apparently gone from the previous day's news conference that saw Castro hit with tough questions from U.S. reporters. How quickly political change comes to Cuba, if at all, is uncertain. But the response from at least some Cubans was certain to be seen by Obama as validation of his belief that restoring ties and facilitating more interactions between Cuba and the United States is more likely than continued estrangement to spur democracy. "What the United States was doing was not working," Obama said. He reiterated his call for the U.S. Congress to lift the economic embargo on Cuba, calling it an "outdated burden on the Cuban people" — a condemnation that was enthusiastically cheered by the crowd at Havana's Grand Theater. The president's visit was a crowning moment in his and Castro's bold bid to restore ties after a half-century diplomatic freeze. While deep differences persist, officials from both countries are in regular contact, major U.S. companies are lining up to invest in Cuba, and travel restrictions that largely blocked Americans from visiting have been loosened. After arriving Sunday, Obama plunged into a whirlwind schedule that blended official talks with Castro and opportunities to soak in Cuba's culture. He toured historic sites in Old Havana in a rainstorm, ate at one of the city's most popular privately owned restaurants and joined a big crowd for Tuesday's baseball game. The fans roared as Obama and his family entered the stadium, which underwent an extensive upgrade for the game. Castro joined the Obama family and sat alongside the president behind home plate — one of several moments from the U.S. president's trip that would have been barely imaginable just months ago. Obama also met Tuesday with about a dozen dissidents, praising them for showing "extraordinary courage." The group included journalist Miriam Celaya, attorney Laritza Diversent and activists Manuel Cuesta and Jose Daniel Ferrer. The White House said the meeting was a prerequisite for Obama in coming to Cuba. Yet the gathering did little to appease those who say he hasn't gotten enough human rights concessions from the Castro government to justify the American economic investment expected to pour into the island. Cubans have been riveted by 15 months of changes in their country's relationship with the United States. But they've learned of it almost entirely through state-run media who have focused on two primary themes — the embargo's continued responsibility for Cuban economic problems and the importance of Cuba changing at its own pace, not one imposed by Washington. Obama's speech was the first opportunity for Cubans to hear his vision of warming U.S.-Cuban relations as closely linked to Cuba's internal evolution. It's a vision of free speech, free assembly and the ability to earn a living without relying on a centrally controlled economy. The president appeared to deliberately use neutral terms to describe the Cuban state: "a one-party system" and "a socialist economic model" that "has emphasized the role and rights of the state." Associated Press writers Josh Lederman, Andrea Rodriguez and Peter Orsi contributed to this report.